As a dentist, I care for the whole person, not only their teeth.I am a people-person. I thrive on the relationships that develop with my patients. I want to know them on a personal level; learning about their lives and interests. As I spend time with a patient, we talk about their life, health, and overall well being. It’s my goal to help each person to develop optimal oral and body health. I teach each patient about dental hygiene, nutrition, and developing positive habits; including running, biking and excercise goals. One of the things I love most about my work is the long-term connection with my patients. I enjoy watching the children in my practice grow up, have children of their own, and then bring those children here for their dental care. I am honored to care for multiple generations of families, from toddlers through great-grandparents, and love watching families grow. I have worked hard to become a respected member of our medical community. Helping people get out of pain, improving smiles, and restoring function are highlights of my profession. I feel I am doing something positive on this earth and making the most of the education and opportunities that I’ve been fortunate enough to receive. Dr. Radmanesh is committed to providing leading-edge, conservative dental care. He remains at the forefront of advances in technique, technology, and materials through continuing education. Dr. Radmanesh has completed several courses on dental implants. 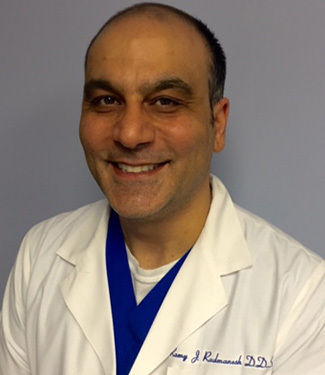 He has also extensively studied endodontics, periodontics, and oral pathology. Dr. Radmanesh is actively involved with two dental study clubs: The Chevy Chase Millennium Club and the Bi-County Study Club. These groups allow him to learn from the leaders in the dental field and collaborate with colleagues. Dr. Radmanesh is certified by The Northeast Regional Board of Dental Examiners and maintains an active Maryland State Dental Board license. Dr. Radmanesh has donated many professional hours. He has worked in nursing homes throughout Maryland, caring for the elderly residents’ dental needs. He has also volunteered with Mission of Mercy weekends in Western Maryland, providing free dental care for the less fortunate in our community. After growing up in Cumberland, MD, Dr. Radmanesh now lives in Rockville with his wife, Maura, and their two chocolate labs, Charlie and Lucy. Maura is a pastry chef at Clyde’s Tower Oaks Lodge in Rockville. The couple enjoys quality time together, along with time with family and friends. When he’s not working, Dr. Radmanesh loves running and biking. He also enjoys listening to music, playing the guitar, watching movies, and photography. He’s an avid reader and likes following politics, too.